The easy way to add lightweight, affordable style to any garden. 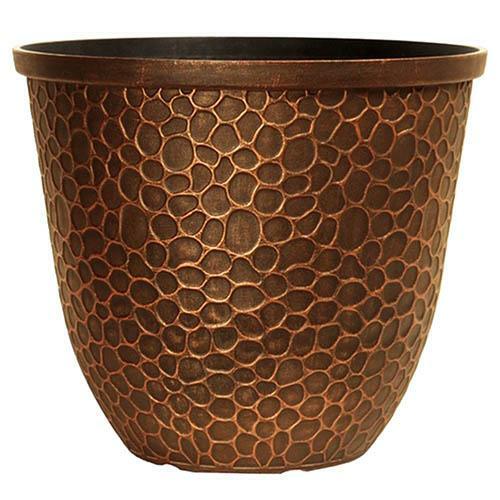 Create a statement in your garden with this hammered gold-effect planter. A large, very tough and durable planter that is perfect for bulbs, bedding, shrubs, houseplants and more, it's made to last from heavy duty polypropylene, with a dramatic, hammered design. At a fraction of the cost of a metal pot – it will adorn your patio for many years. Stylish and modern, the finish gives a metallic feel to the planter, making it a feature in its own right. Reproducing a hammered finish, this weather resistant, plastic planter is UV stable and will really last the test of time meaning you can use it year in, year out. This stunning metallic-looking planter will add an exquisite decorative look to your home or garden, without the cost of real metal pots and being polypropylene, it is also light weight, so easier to pick up and move around when compared to metal containers. Perfect as a contrast if you have a group of pots, where the patterned design helps draw your attention to the group and therefore the plants. Perfect for indoor or outdoor use, you'll receive a single, 30cm (12in) gold-tone planter. Diameter: 30cm (12in), Volume 9.5L approx. Made from a durable UV stable plastic, and finished with a hammered gold effect.